Now this is a good looking exercise bike! We’re excited to introduce the Assault Air Bike. 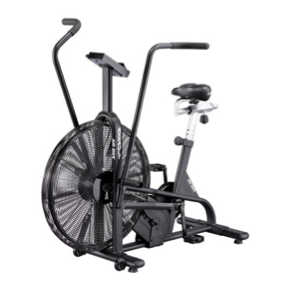 It’s a reinvention of the old school Air Dyne – with some cool new features added on. The uniqueness of the air resistance system is that it offers as much resistance as you can handle. The harder you pedal the greater the resistance. It also has a computer, to tell you your time, distance, speed and calories. And if you’re looking for an extra challenge, try out the built in programs including TABATA, target calories and target distance.